Eleven years ago I wrote a screenplay, a rather lame comedy about a lesbian, her brother and their father who are the trinity of boneheads in their failed relationships with women, but at least the father had a good excuse since he was a widower; sis and bro were two knuckleheads. This script elicited the level of response that lies between indifference and buzz. Now this script lies in a Pottery Barn wicker basket full of other screenplays, plays and stories I’ve written that have a promising future as mulch. What I remember most about that script, since even the title escapes me as I write this post, is that it was the calling card that granted me a meeting with a script reader at Miramax, when the company was still run by the Brothers Weinstein. Full disclosure: I would like to say she agreed to read my script and hold a meeting with me because I wrote such a stellar query letter, but what separated my project from the herd was that I included a Valrhona chocolate bar with my pile of typing. Script Reader: I was on the fence about your script, but now that I see you’re carrying a navy blue Manhattan Portage satchel, I’m going to pass it onto Harvey and Bob. Yet, that would have been novel. In reality, the meeting went well. She said she liked my script, she was under the impression that I had literary promise and wanted to read whatever I write next. Her exact industry-sounding phrase was, “I’m going to track you.” Unfortunately, there was little to track since it took me five years to write a follow-up opus, and by then, that script reader had moved on and the opportunity had derailed. I thought, “I should bring my ailing satchel to Eddie! Surely, he’ll have the zipper I need!” What might that zipper cost me? I looked on his web site and it seems he has YKK products that cost as little as $1.50. Sweet! Hm, where would I go to have my satchel repaired? I could go to one of the tailors in my neighborhood that hems my pants. These guys charge $12 for hemming. What might they charge for an alteration that is not even on the alterations chart? On the Upper West Side, if it’s not on the chart, that means prepare to pay even more. I can handle a needle and thread; maybe I should just assume this task myself? Considering that I have yet to get around to resewing a button that fell off a coat two months ago, who am I kidding? It will probably take me years before I would find the motivation to make this repair to my bag myself. “So, what to do?” I asked myself. And that’s exactly what I did. I ordered the same bag. It now costs $5 more than what I paid in 2000. I thought that was odd but when I received my new bag a few days later, I noticed that the label has been updated. It’s still the Manhattan Portage logo, but it no longer claims it’s made in Manhattan, for obviously, it’s not. If it were, then it would cost much more than what I paid for it ten years ago. 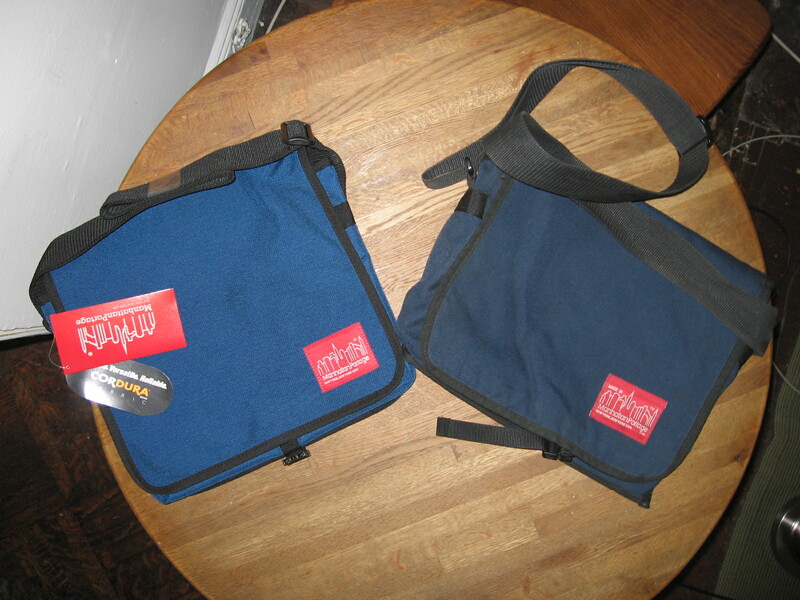 New bag made who knows where on left and an original made in Manhattan Portage on right. I still want to meet Eddie Feibush and check out ZipperStop. I’m sure that’s a building full of not only a million zippers, but millions of stories. This entry was posted in Humor and tagged eddie feibush, manhattan portage, miramax, zipperstop. Bookmark the permalink.